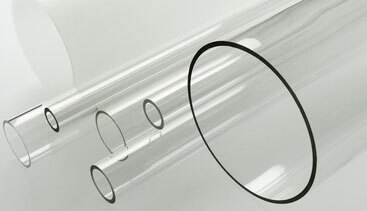 Acrylic tubes (standard) of various diameters (fitting VSI and BARTZ MR camera systems and the MR scanners of competitors) can be purchased, other materials are available upon request. See below for details on dimensions and material properties. In addition, we can cut MR-T to length and refine them; standard lengths are 1 or 2 m. Please note that extra shipping cost occur for tubes longer than 1.15 meters (i.e. 1.2 m parcels) due to carrier regulations. Please inform us about the tube dimension (inner & outer diameter!) you wish to use when ordering a MR camera. It is recommended to close your minirhizotron observation tubes on both sides to prevent water, dust and daylight to enter. We can supply (removable) end caps or produce all possible types of permanent seals (bottom only). Please note, the automatic VSI MR systems for horizontally installed tubes require special end-caps to position the gear rack. If installed in non-temperate ecosystems, an extra insulation of the protruding MR-T part is recommended to minimise changes in soil temperature around tubes. In any case, light should be excluded from entering protruding parts by applying an opaque paint or foil to those sections. Machine-readable tags glued to the top of each tube can be used by certain VSI MR camera devices for automatic tube detection and programming of locations (in the automatic systems). Standard tube length are 100 and 200 cm; other length are available on request and costs for cutting to length apply. Other tube length are based on prices for 100 or 200 cm-tubes respectively + costs for cutting. Other metric tube dimensions upon request and according to availability. Please be aware that the fixed-focus MR imaging systems of VSI-Bartz are factory adapted to the specified MR tube dimension given during ordering. USA: Please contact Bartz Technology Corporation for details on acrylic MR tubes in the US and for any non-metric tube dimension (INCH). However, in most cases the metric 7- or 6-cm MR tubes fit US MR imaging systems well and we can send you an example piece if you want to try yourself before ordering. Poly(methyl methacrylate) (PMMA), also known as acrylic or acrylic glass as well as by the trade names Crylux, Plexiglas, Acrylite, Lucite, and Perspex among several others, is a transparent thermoplastic often used as a lightweight and shatter-resistant alternative to glass. Its environmental stability (UV and weathering) is superior to most other plastics and PMMA is therefore the material of choice for outdoor applications such as MR tubes. A review on the influence of MR tube materials on root production and turnover revealed that data from acrylic MR tubes matches standing root biomass more closely than using butyrate MR-T. For both plastics, chemical reactions on the surfaces and the release of small molecular weight chemicals are possible, but probably more common for butyrate (see Withington et al. 2003, New Phytol. for details). Please see the section addressing MR soil corers, for manual installation of MR tubes. Iversen, C., M. Murphy, M. Allen, J. Childs, D. Eissenstat, E. Lilleskov, T. Sarjala, V. Sloan, and P. Sullivan. 2012. Advancing the use of minirhizotrons in wetlands. Plant and Soil 352:23-39. Kloeppel, B. D., and S. T. Gower. 1995. Construction and installation of acrylic minirhizotron tubes in forest ecosystems. Soil Science Society of America Journal 59:241-243. Levan, M. A., J. W. Ycas, and J. W. Hummel. 1987. Light leak effects on near-surface soybean rooting observed with minirhizotrons. In H. M. Taylor, ed. Minirhizotron observation tubes: Methods and applications for measuring rhizosphere dynamics. SSSA, CSSA, and ASA, Madison, WI, USA. pp 89-98. Withington, J. M., A. D. Elkin, B. Bulaj, J. Olesinski, K. N. Tracy, T. J. Bouma, J. Oleksyn, L. J. Anderson, J. Modrzynski, P. B. Reich, and D. M. Eissenstat. 2003. The impact of material used for minirhizotron tubes for root research. New Phytologist 160:533-544.